The neurological intensive care unit in Heidelberg offers comprehensive and state of the art neurological intensive care and training. Besides stationary care for the severely ill, we are also responsible for the care of unstable patients in the emergency and neuroradiology departments, and together with the anesthesiologists, for the emergency service of the entire Kopfklinik and NCT. Scientifically, we maintain an outstanding national and international reputation in the field of intensive care medicine. We undertake a large number of studies, especially to improve the care of patients requiring ventilation following a severe stroke. The Acute and Critical Care Neurology Program is based on the strong clinical and scientific tradition in emergency and neurocritical care developed in Heidelberg over the last 30 years. With a focus on patients with severe cerebrovascular diseases requiring intensive care unit treatment and mechanical ventilation, Heidelberg has led the way to improve patients’ prognosis and regain quality of life. In 2010, >450 patients were admitted to the Neurological Intensive Care Unit (NICU) with an average length of stay of 11 days. Numbers increased to >670 in 2015 with an average length of stay of 8 days. These severely afflicted and complex patients are taken care of by a team of over 40 specialized nurses, 6 residents, 1 resident-in-chief, 1 attending and 1 section head, the latter two holding sub-specializations in neurocritical care. The NICU team provides optimal diagnosis and individualized treatment plans for critically ill patients in the 12-bed-NICU, the ER and the angiography suite during endovascular interventions, and responds to resuscitation alarms of the entire Kopfklinik. Overarching goal of the program is the development of cutting-edge approaches in neurocritical care and to be involved in and lead (inter)national collaborations to further optimize the care of patients with devastating neurologic pathologies in the acute and intensive care setting. 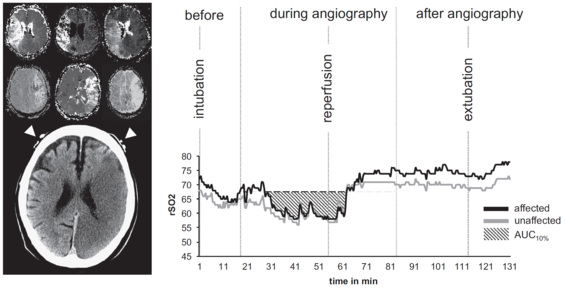 Non-invasive neuromonitoring of cerebral oxygenation by Near-Infrared Spectroscopy during intensive care and endovascular stroke treatment (Noninvasive cerebral oximetry during endovascular therapy for acute ischemic stroke: an observational study. Hametner C, Stanarcevic P, Stampfl S, Rohde S, Veltkamp R, Bösel J. J Cereb Blood Flow Metab. 2015). Research of the Critical Care of Stroke group (J. Bösel) focuses on improving brain oxygenation after severe stroke. The impact of compromised oxygen delivery in stroke patients with NICU anemia was demonstrated in the STRAIGHT study (Kellert Stroke 2011). Noninvasive neuromonitoring of brain oxygenation by NIRS and its prognostic utility during thrombectomy was shown in the COMMAND study (Hametner JCBFM 2015). Oxygen- and energy-saving innovative sedation techniques were investigated with regard to safety and feasibility of volatile NICU sedation in the VANISH studies (Bösel Int Care Med 2012; Purrucker BJA 2015). Strongly connected with oxygenation is airway management of stroke patients. Safety, feasibility and potential benefits of early tracheostomy were elucidated in the first prospective pilot randomized trial SETPOINT (Bösel Stroke 2013) and a score developed to trigger early tracheostomy (Schönenberger Neurocrit Care 2015). Unique to Heidelberg, the NICU team has always been responsible for the peri-interventional management of endovascular stroke care, which has recently become standard of care for large vessel occlusion ischemic stroke. With thrombectomy rates rapidly rising, the group has been pivotal in further optimizing and investigating aspects of peri-interventional management including the first randomized trial to compare non-intubated sedation with intubated general anesthesia (SIESTA;Schönenberger Int J Stroke 2015; Schönenberger JAMA 2016). Based on these and other achievements in the past, the program was extended to develop and lead international multicenter trials, such as the follow-up trial on early tracheostomy, SETPOINT2 (Schönenberger Int J Stroke 2016). The Acute and Critical Care Neurology Program is part of several research collaborations and networks, such as the DGNI and its research network German NeuroIntensive Trial Engagement (IGNITE), the Deutsche Interdisziplinäre Vereinigung für Intensivmedizin (DIVI), or the Neurocritical Care Society (NCS) with its research network NRCN. The section has made major contributions to many relevant multicenter NICU trials, such as DESTNIY II, DEPTH-SOS, INCH, CLEAR-IVH III, and ATACH II.